Bacolod City, Philippines – Juggling the demands of work and school can be very challenging. Especially in the busy world of showbiz, not many artists would still want to pursue their studies when they’re already successful in the business. But for multi-awarded Kapuso actor, host, and producer Dingdong Dantes, who is busy preparing for his upcoming international movie titled “Dance of the Steelbars” and is also currently taking up BS Technology Management in West Negros University (WNU) Bacolod, keeping a balanced career and education requires sacrifice. “Importante kasi sa akin ang degree kasi I plan to pursue masters… Due to my busy schedule sa work, I only get to travel here in Bacolod to study once a month. Kaya I’m very thankful with my school because they make it easy for me as a working student,” said Dingdong. 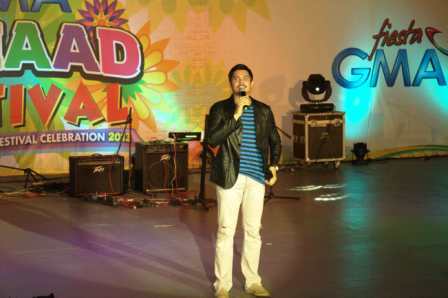 Just recently, Dingdong was in the city together with fast-rising Kapuso actress Max Collins and versatile singer-actress Julie Anne San Jose for the 20th Panaad Festival Opening. After the annual local dance contest, they staged a mini concert party at the Panaad Park and Stadium last April 8 for all present Kapusong Negrenses who came from the province’s various cities and municipalities. Meanwhile last April 12, Indio’s Aljur Abrenica and Kakambal ni Eliana’s Chynna Ortaleza spiced up the Panaad festivities even more as they graced the Lin-Ay Sang Negros Pageant Night as guest singer and host, respectively. The following day, Tween stars Barbie Forteza and Derrick Monasterio bannered a Kapuso Mall Show in SM City Bacolod. “Our sincerest thanks to all Kapusong Negrenses who celebrated the Kapuso Panaad Festival activities with us. We dedicate the success of our events to them who have been there all the way. As our way of giving back to their support, we promise to mount more exciting activities and bring more of our brightest Kapuso stars all throughout Negros Occidental in the coming months,” said Oliver Amoroso, AVP for GMA Regional TV.